EMC Planning Group prepared a biological resource assessment for an approximately 2,400-acre property near King City in Monterey County, California. Tasks included reviewing all available planning area information, including topographic maps and plan maps to define the scope of the biological investigation; conducting a background data search to determine the potential for rare species in the vicinity of the planning area; conducting field surveys of the planning area to (1) identify and map the principal plant communities and (2) assess the potential for special-status species and their habitats, wildlife movement corridors, potential jurisdictional wetlands, and other significant biological resources to occur in the planning area; and consulting with various agencies, other consultants, and local biological experts regarding potential impacts and mitigation measures. A biological resources assessment report was prepared to describe existing habitats and plant and animal species found in the planning area, the occurrence of and/or potential for special-status species and their habitats, and the need for further studies associated with the environmental review process. Predominant vegetation types within the project boundary include vineyards, non-native grassland, oak savannah, and oak woodland. 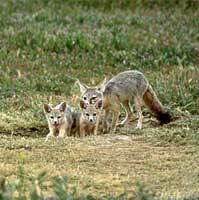 Special status species with the potential to occur at the project site include special status plants protected raptor and bird species, bats, San Joaquin kit fox, and San Joaquin pocket mouse. Continuing work includes coordination with the USFWS and CDFG for protocol-level surveys.